Property 6: New Orleans Home w/Patio - 2 Mi to French Quarter! RELAX IN BEAUTY & GRACE BEHIND THE GREEN DOOR! Property 13: RELAX IN BEAUTY & GRACE BEHIND THE GREEN DOOR! 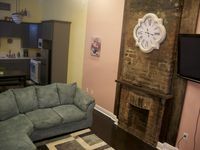 Property 14: New Orleans Home w/Hot Tub-1 Mi to French Quarter! Beautiful Corner Gem w/Private Wraparound Balcony In Historic Bywater! Property 15: Beautiful Corner Gem w/Private Wraparound Balcony In Historic Bywater! Property 19: This is it!! A great place for a group get-together! Property 26: Elegant Lower Garden District Home. Ideal location, with Gated Parking. Property 29: Walk everywhere in the FQ! Property 32: Classic New Orleans Home Near French Quarter and Frenchmen St.
Property 34: New Orleans at it's Best - Charming Studio, Great Location! Property 37: 3 blks to Frenchman- 6 blocks to French Quarter. Reserved Parking! Property 45: Whole House -1 Block to Frenchman St. -With Courtyard! Property 50: Jazz fest stay- April 24-30th available!! !